With a total floor area of 4,089 square feet and finished floor space of 2,433 square feet, the Hickory will serve as a comfortable home for a growing family. It has a three-car garage, 2.5 baths, and 4 bedrooms that include a master suite. The master suite has its own spacious bath and walk-in closet and is found on the first floor. Across it is a formal living room and a wide area that includes an island kitchen and the family and dining areas. The 3 remaining bedrooms and a shared full bath are found on the second floor of the home. The Hickory also features a small porch and an optional fireplace in the family area. Customizing and owning this charming two-story home is a breeze with Perry Homes Utah. We’ve lasted more than 40 years in the home design and building business by offering a seamless home-building process, financial options, reasonable prices, and excellent customer service. We have design specialists who will ensure that each house plan is designed and built to suit the preference and lifestyle of our clients. Plus, we can also offer assistance in addressing post-construction concerns. Enjoy a hassle-free home-buying experience with Perry Homes today. 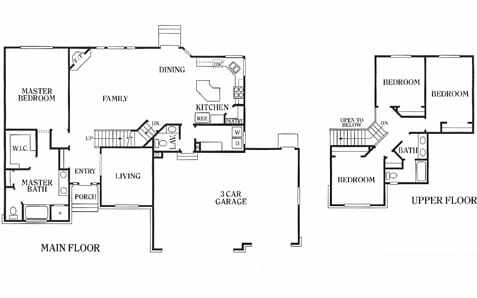 Inquire about the Hickory or any of our rambler homes and two-story house plans by calling 801-264-8800 or leaving a message on our Contact Us page.